Why would anyone look for an espresso machine under 100 dollars? 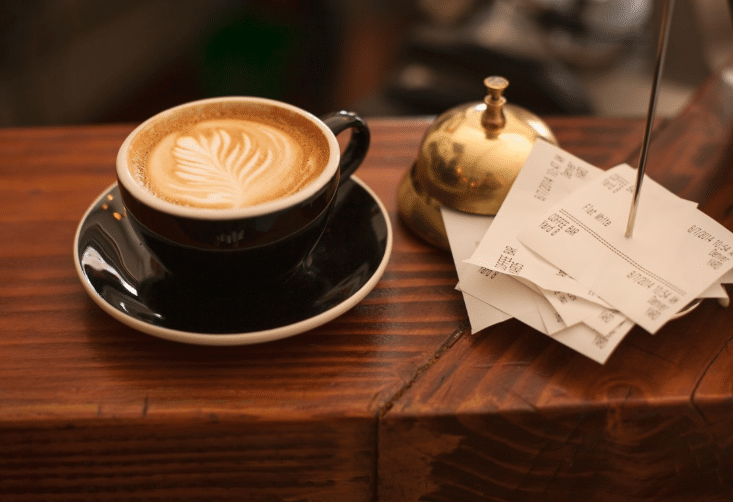 Most coffee lovers discover coffee from buying it at a coffee shop. They then get interested in trying to replicate that taste at home. They might experiment with French presses or drip filters. They might even buy a regular coffee maker. But eventually, almost all of them end up looking for an espresso machine. Unfortunately, a good fully-automatic espresso machine may be out of most people’s price range. For many, this is the end of the hunt. Don’t give up just yet. If you are looking into buying an espresso machine but not yet ready to commit to making a very big investment, you can find the best espresso machine under 100 but still produce a decent shot of espresso. 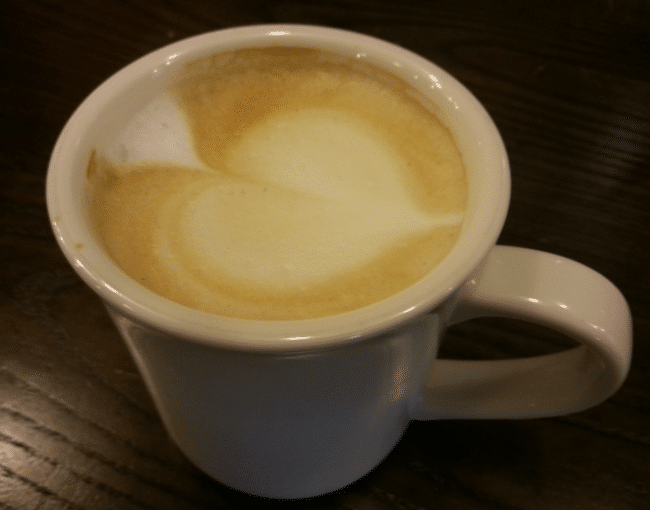 What to Look For in the Best Budget Espresso Machine? 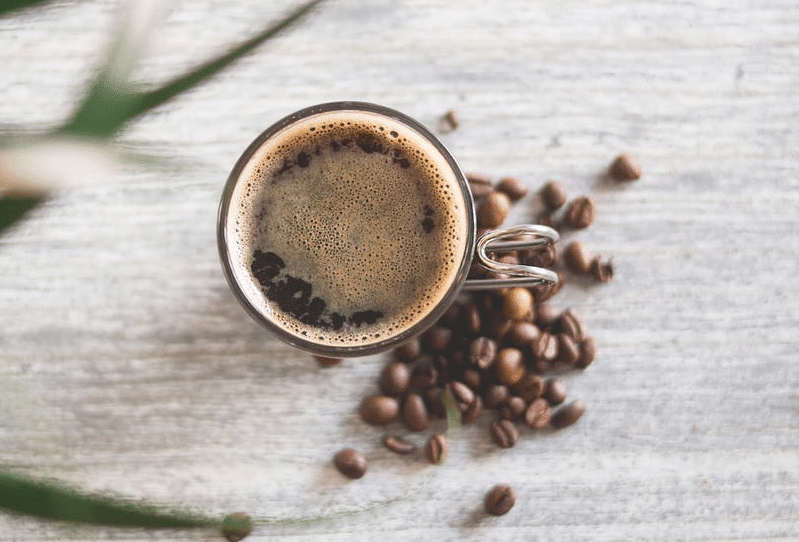 There are two things to look for in an espresso machine that will produce the perfect shot: high enough water pressure and consistent water temperature. The ideal water temperature is 90 degrees Celsius. This should be held consistently throughout the brewing process. The machine should also have good bar pressure. It is this pressure that creates the crema. It is what extracts the flavor and aroma from the coffee grounds. For decent extraction, the machine should at least have a bar pressure of 15 to 19. These five machines all have the right properties to make a decent espresso. The Mueller Espresso Machine is one of the favorites of novice espresso makers. It consistently makes good coffee and is surprisingly affordable. The design is smart and utilizes space effectively. It has a very small footprint so it would take up very little space on your countertop. Despite this, this low-cost espresso machine has a capacious water tank. It can carry as much as 0.8 liters of water. The transparent tank makes it easier to keep track of the water level so you can refill it before it goes empty. It is also detachable and dishwasher safe. That makes cleaning it a lot easier. The only issue is here is that it is attached to the back. If you have a low shelf above the space where it is situated, you have to move it forward to gain access to it. Besides being small, this machine is also very lightweight. It only weighs 2.2 pounds. That makes it super portable. It even has a handle on top so you can easily move it around. Some people posted that this handle tends to be a little stiff. One good thing about this though is that it stays in place when you drain the used-up pods. The Mueller espresso machine produces up to 20-bar pressure. This is higher than what is required to produce crema and is much higher than what other models of inexpensive espresso machines can provide. This enables the espresso machine to deliver premium aromas and full flavor from every capsule. You’ll be able to produce great cappuccino, café latte, or cafe Americano. It is equipped with a fast heat-up system. This machine can be ready for use 25 seconds after starting it up. It has an energy-saving feature. After ten minutes of idle time, it automatically switches off. This is an awesome feature for people who constantly forget to turn off their coffee machine. This way, you won’t have to keep on coming back home to check on your espresso machine if you leave it on. This espresso machine is very easy to operate. It is really the perfect one to buy if you are an absolute beginner in making coffee drinks at home. With one touch of a button, you can make two cups of espresso. You can reprogram the machine to make an espresso or a Lungo. The controls are backlit so you’d be able to push the buttons even if your kitchen is dark. All you have to do is open the chamber for the Nespresso capsules, close the lid, then press the button showing what size of drink you want. After a few seconds, you’ll have the coffee drink ready in your cup. It comes with a removable tray or stand so it could accommodate a demitasse cup. This raises the cup right to the spigot to avoid splashing. If you want to use a mug, you can just remove the tray. Mueller offers people who buy this espresso machine a chance to get it replaced any time. A lifetime replacement policy is an ultimate proof of how much confidence the manufacturer has on its products. They also provide a 2-year warranty. For espresso and frothed milk that you can make on the go, you can try out the STARESSO portable espresso maker. 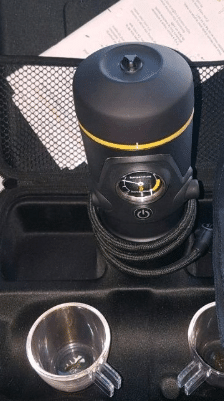 It is touted as one of the best manual espresso makers for people who want to have their espresso while camping or during the commute. It comes in parts but putting it together is just like putting the cover on your coffee tumbler. It has a thick-walled cortado glass container at the bottom. The filter goes in the middle. The top is the container for grounds or pods. The materials used to construct this espresso makes it an ideal travel coffee machine. It is 8.2 inches in length and the perfect size to hold in one’s hand. It only weighs 1.1 pounds. It can contain 80 ml of water and 10g of coffee grounds max. The design is pretty sleek and the espresso maker looks very sophisticated. The STARESSO Portable Espresso Maker is compatible with ground coffee and Nespresso capsules. 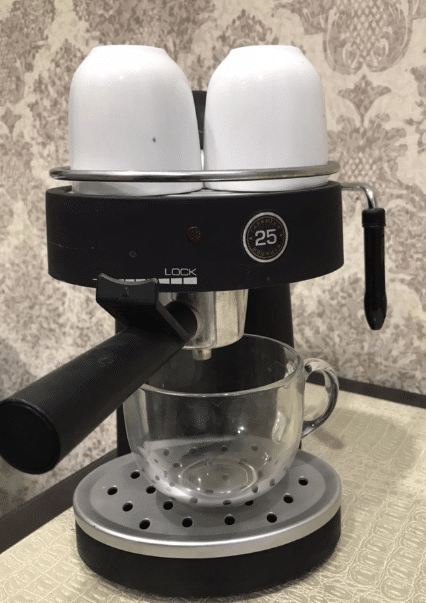 The espresso shot from this affordable espresso machine can be used to make various coffee drinks like Iced Coffee, Mocha, Latte, Americano, Cappuccino, and Ristretto. It is equipped with a patented pumping system that is capable of producing 20-bar of stable pressure. 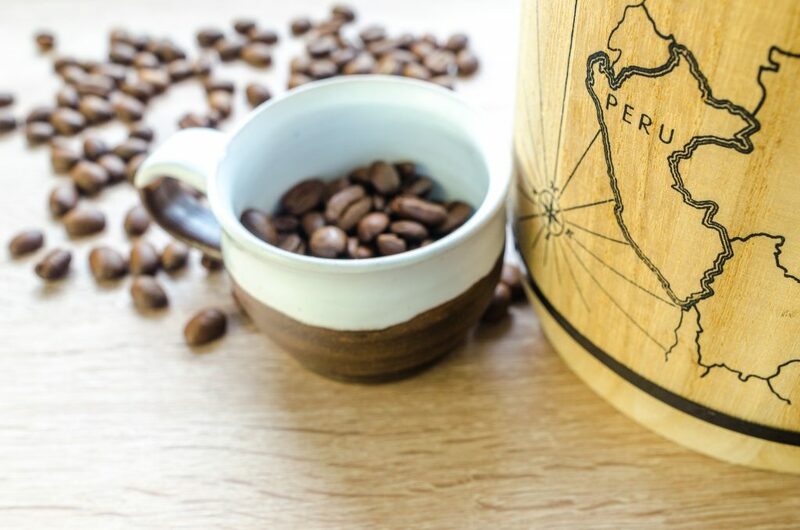 This allows the user to extract the maximum amount of flavor and aroma from his or her chosen beans. The pump is so efficient that it requires 50% less effort from pumping as other models. It does have a tendency to stick the more it is used. Making one or two cups of espresso might go without a hitch but making more could prove tiring and problematic. This shouldn’t be an issue most of the time since this espresso maker under 100 is designed for personal use. Besides being easy to use, this espresso maker is also easy to clean. It doesn’t need any special maintenance. All you have to do is take the pieces apart and load everything onto a dishwasher. It is okay to expose the tumbler to heat because it is made of high-quality BPA free materials. You don’t have to worry about any dangerous chemicals leaching into your drink. Making an espresso shot using this maker can take a while because you have to pre-heat everything, even the espresso maker itself. You can also use lukewarm water and milk but you’d have to settle for drinking lukewarm espresso. You would still get good quality crema and flavor but nobody enjoys drinking espresso that’s not hot unless they’re making iced coffee drinks. To preheat the parts of the tumbler, you need to dip them in hot water for about half a minute. Some claim that the pressure generated by the espresso maker is not enough to pierce the foil cover of a Nespresso pod. You might have to pierce it manually to be able to use the pods on this system. You might have to use two pods to achieve the coffee intensity that you want. This can make each drink a little more expensive. The STARESSO is also designed to froth milk so you can make any milk-based coffee drink on the fly. Again, it should be preheated so you don’t add cold milk foam to your espresso. Some coffee experts say that it takes too much effort frothing heated milk in this espresso maker. It might be easier to just use a separate whisk or frother. The tamper scoop has been deemed flimsy by a lot of users. It is made from thin plastic and it is too small. However, it is enough to tamp down coffee grounds enough to still make a decent cup. 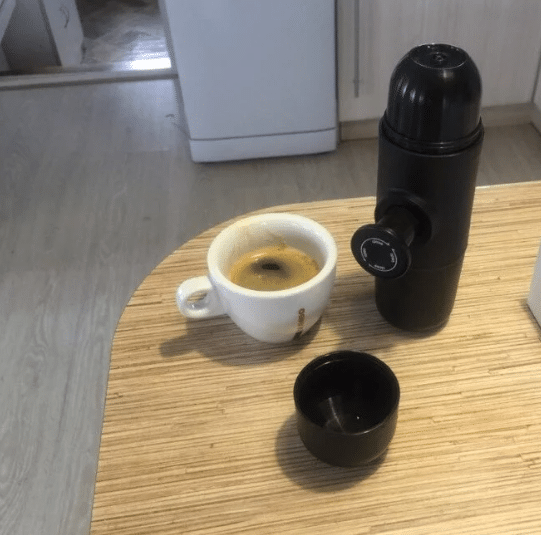 This Wacaco Minipresso GR is another portable espresso maker that is designed for delivering great espresso shots even while you are outside your home. It is a compact, lightweight, and very versatile machine that is worth considering. Unlike the previous portable espresso machine, this only works with grounds. There are other Wacaco Minipresso models that work with capsules and grounds but we will only work with this GR model for now. It only weighs 0.8 pounds. That is light enough to put in your backpack if you are going camping. 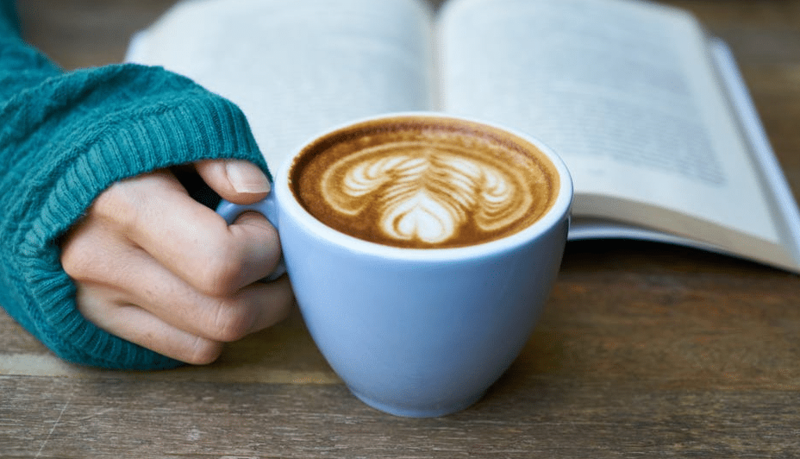 While you may choose to forgo the luxuries of modern living at your campsite, it doesn’t mean that you can’t enjoy a good cup of coffee when you wake up. The Minipresso GR can produce 50 ml of good and authentic tasting espresso anywhere and anytime. It is very easy to use. Most understand how to make a cup even without the manual. All you have to do is to fill the filter basket with your chosen coffee grounds. You can do this using the scoop that comes with the system. Press down on the grounds to make it level. Pour water into the water tank. Note that you should avoid overfilling the water chamber as it will overflow. Then you have to unlock the maker from its travel position. Grab the piston in order to pump pressure into the chamber. It should take only a few pumps to extract a good shot of espresso. Don’t go too fast so you don’t break the espresso maker. One pump a second should be fast enough. The system is effective enough to produce 8-bars. While it may not be as strong as most electric espresso machines, the pressure is enough to produce a good amount of crema and extract flavor from the grounds. Some users commented that the coffee they make from the same amount of grounds is weaker using the Minipresso. This is explained by the weaker pressure that it generates. The set comes with three filter baskets plus caps. This means, as long as you have access to how water, you will be able to make 3 servings of espresso drinks per go. The set also comes with a mini case made of soft fabric and EVA material to keep the tank protected. If the chamber is empty, you can store the filter baskets inside the tank. The Minipresso can get gunky so you need to clean and dry the parts thoroughly after every use. Unfortunately, the parts are not dishwasher safe, you’d have to clean it the old fashion way, scrubbing it with a soft brush using lukewarm water and mild detergent. People who forget to clean out their espresso maker learned the hard way that it develops a fibrous mold in the brew chamber if you forget to wash it after a few uses. Drinking moldy coffee is probably not what you had in mind when you buy an espresso maker under 100, so make sure that you perform this maintenance step. 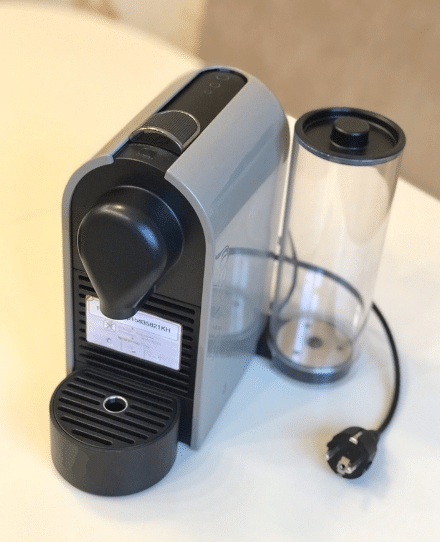 Wacaco does not have a lifetime return policy but the manufacturer says that if you are not satisfied with the Minipresso GR, you can return it for a replacement or a refund as long as you call or email them within 30 days of purchase. 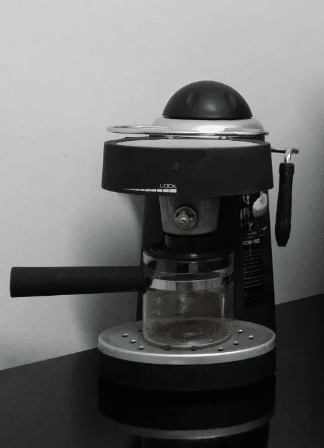 This last inexpensive espresso machine runs on electricity. It allows users to make espressos and cappuccinos with a touch of a button. This machine has the feel and look that will let you play barista in your own home. The manufacturer of this basic espresso machine says they take the guesswork out of espresso making. You don’t have to worry about temperature, pressure, and length of pulling the espresso. The machine will take care of all those for you. The Bella Personal Espresso Maker comes with everything you need to make different coffee drinks. It has a glass decanter, permanent filter basket, and a steam wand for milk. It is capable of brewing lattes, cappuccinos, macchiatos, and americanos. The Bella Personal Espresso Maker is fairly small. It only measures 9.45 x 9.45 x 11.22 inches. You can place it on your counter or use it while it is in a small kitchen shelf. As long as you have enough space to pour water into its water chamber, you are good to go. The body of this basic espresso machine is made of plastic. According to the manual, the black plastic can leach into your counter and cause a stain. This is troublesome as if it can leach into your counter, it can leach into your drink. One downside to using this machine is that you cannot customize your drink too much. You have to content yourself with the quality of the espresso shot that is created using the pre-programmed settings of the manufacturer. The only thing that you can control is the volume of the espresso shot and the size and type of coffee grounds to use. This is the compromise that you have to make for getting inexpensive espresso machines. It is fairly easy to make a serving of coffee drink on the Bella Espresso Maker. Once you have filled the filter basket with coffee grounds using the scoop that comes with the system, you just need to clip in the brew head and turn it so it would lock in place. Once the grounds are ready you need to fill the water reservoir. Some people commented that the cover of the reservoir can be hard to turn. Now, all you need to do is turn the knob to the espresso setting for it to start brewing. There should be enough water to make up to four cups if you filled the reservoir completely. It takes a couple of minutes for the machine to heat up and brew the coffee. The pump is able to generate 3 bars of pressure. This is way below what is required to produce the crema that espresso is known for. Some users commented that they did not get the crema that they were looking for while using this machine. The Bella Espresso Maker has a built-in steam wand that will enable you to make frothed milk for your drinks. It heats up quickly so you can make a pitcher of steamed and frothed milk in a matter of seconds. This is perfect for making cappuccinos and other milk-based drinks. It is very easy to use. All you have to do is pour a cup of cold milk into your pitcher. Place the pitcher under the wand then turn the knob to milk steamer. It should be done after a few seconds. There are some negative feedbacks on the machine’s knob. It seems that it is too stiff to operate. Some user claims that they have to grasp it really hard and turn to make it work. This is difficult if your hand got wet in pouring the water into the machine’s reservoir. Additionally, the knob breaks after only a few months of use. Since the knob is the only way to operate all the functions of the machine, your espresso maker is rendered useless once the knob goes. The removable drip tray and the Bella’s pressurized cap are all built to prevent leaks. The filter basket is easily removable to make it easy to clean. The glass decanter has an easy-pour spout to prevent drips or spills. The glass used has a cool touch feature so you don’t accidentally burn yourself as you are serving and spill on yourself. All these features ensure that you do not make any mess as you make your espresso. Unfortunately, people commented that the carafe’s lid opening is a little small. If you do not align it properly with the brew head, you will end up with all the coffee on the counter rather than in the glass decanter. All the removable parts are dishwasher safe. This means you wouldn’t have to worry about keeping the unit clean. Just throw out the used coffee grounds and load everything into your dishwasher. While the quality of the espresso made using these models of low cost espresso machine may not be as great as the quality of the shots that you get from deluxe super expensive machines, you can still produce good espresso. Now, all you have to do is choose whether you want to get a manual espresso maker or one that runs on electricity. Once you have decided on that, you can begin choosing which is the best espresso machine under 100 for you.